Cloudinary's digital asset management solution bridges the gap between asset management and delivery, enabling creative, marketing and development teams to maximize the value of assets, streamline workflows and optimize the end-user experience. The same powerful platform that enables developers to programmatically upload, store, manipulate, and deliver optimized media content also offers an easy-to-use visual platform designed with both creative and technical teams in mind. This section provides a high-level overview of Cloudinary's DAM features. Learn more in the Digital Asset Management guide. We also invite you to check out our video tutorial screencasts to learn more about getting started with Cloudinary and the features it offers. Drag-and-drop your media assets to upload them in bulk to the Media Library, or upload assets from various external sources including Facebook, Instagram, Google, and Dropbox or any other external URL. The assets you upload to the Media Library are the same ones that your developers reference when they deliver assets in your website or application. There's no need to upload the assets to another system. 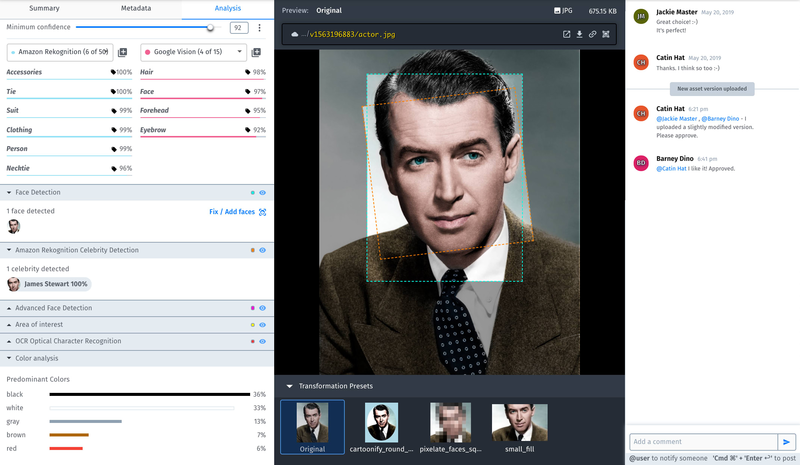 Leverage AI-based content analysis for automatic tagging of images and videos, making your asset library easy to search and browse. Extract and store existing metadata from your media assets and add or modify custom metadata. Search for assets using any combination of attributes and filters. For example, you can search by asset type, size, predominant colors, tags, video duration, automatically captured metadata such as number of faces or location data, and more. Control the areas of the Cloudinary console that account users can access. Organize assets into folders (fixed containers) and collections (virtual groupings), define user groups, and then share your folders and collections with user groups or individual users (collections only) at different access permission levels. This functionality is relevant only for users with the Media Library user role. All other roles that include access to the Media Library area of the console have full management permission for all assets and folders. This functionality is supported for accounts on the Advanced plan or higher with multiple users. For details, contact support. Dynamically manipulate images and videos using simple controls to resize and crop, apply enhancements, and add filters and effects. Cloudinary’s APIs and integrations allow your developers to easily integrate Cloudinary's DAM functionality into your existing technology stack. For example, developers can embed the entire Media Library as an inline or modal dialog box in your CMS, PIM system, or other project management tools to better streamline the creation to delivery process. 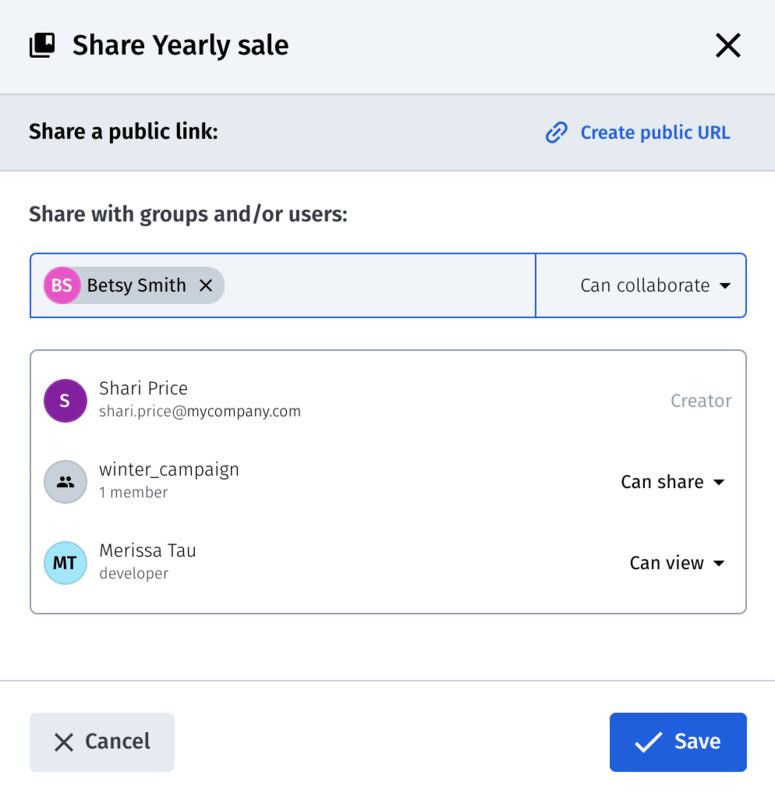 They can also embed a customized version of the upload widget into your user-facing applications, making it simple for user-generated-content to be uploaded directly to your media library. The Media Library is the repository of all your digital assets and the main touchpoint into the Cloudinary DAM solution. From this view you can easily perform an advanced search or navigate through folders to find the assets you need, upload new images, videos, audio, or other files in virtually any format, and select multiple assets to perform bulk operations such as delete, add tags, move, download, or review moderated assets. For implementation details, see Media Library widget.